Making note of his fear of foreign journalists and their questions, Francois Mauriac tells of his chance meeting with a reporter from Tel Aviv, who is later revealed to be Elie Wiesel, the author of Night. As the two begin to converse, Mauriac’s apprehensions are dispelled by the unjudgmental nature of the interview. The men spoke about the occupation of France by the Nazis from 1940 to 1944 – the second world war. Wiesel later divulges to Mauriac that he was once one of the young Jewish children forced onto those cattle cars, and Mauriac begins to speak of the value of Night. 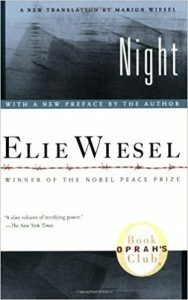 He expressed how there is power in Wiesel’s words; similar to Anne Frank’s memoir. Anne Frank was a German Jew who endured a horrible fate at a concentration camp. Mauriac goes on to state that he feels that Wiesel has given a face to the suffering of the Holocaust by sharing his experiences. Mauriac also affirms that Wiesel’s narrative holds a deep spiritual meaning, particularly in how the narrator depicts his own struggles with God and maintaining faith. To quote what might be the most eminent passage from Night, Mauriac proclaims that the “Never shall I forget that night” passage speaks of profound loss of faith, humanity and identity. He shares how, as a Christian, he was deeply affected by that passage and how it has left him forever changed.